Scouring through every bridal shop in the town, taking trials of different wedding dresses and still cannot find that perfect wedding gown? It can be incredibly overwhelming – both physically and emotionally. Believe us, we have come across many brides-to-be who are too confused and overwhelmed because they cannot find their dream wedding dress. Finding the ‘perfect’ wedding gown becomes insanely exhausting, especially when you are not especially tuned to the latest fashion. We understand how you feel! 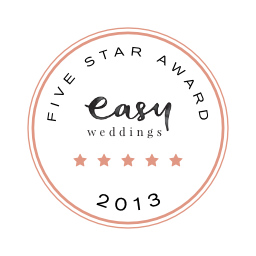 So, our expert wedding stylists bring you a handy and complete guide to different kind of wedding dress silhouettes. A silhouette is the outline of the dress. A designer first draws the silhouette, and then she/he designs the rest of style elements for the wedding gown. Choosing the right dress silhouette accentuates your best features and even mutes down the problem areas. Basic knowledge about silhouettes takes out all the irrelevant and time-consuming guesswork, helping you find the ‘perfect’ wedding dress that sets the right tone for your big day. If you want to accentuates your best features and also want a classic look, A-Line silhouette is the one for you! This subtle and classic silhouette flatters any body-type. It has a narrowed bodice and structured skirt that gradually flares down along your body’s natural shape, resembling an ‘A’. Free free to dance your heart out and celebrate your big day in this easy to wear dress type! As a kid, if you have ever dressed up like a princess (many girls might not have done it! ), this silhouette needs no explanation! A ball gown has a fitted bodice and a full floor-length voluminous skirt typically made with either tulle, organza or taffeta. The contrast created by the voluminous and structured skirt and slim bodice gives a dramatic and elegant hourglass shape. If you have curves, flaunt it! Celebrate the natural and beautiful curves of your body with a mermaid silhouette. 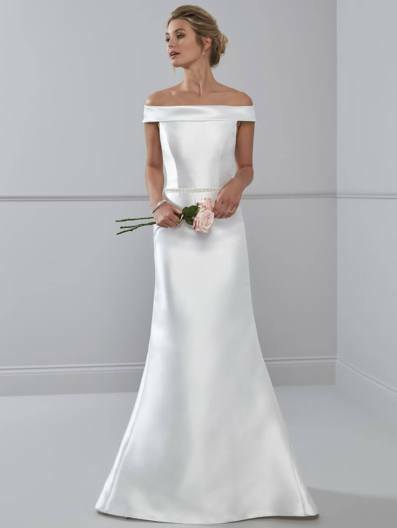 The elongated and fitted bodice highlights the natural curves. And the flaring skirt from mid-thigh or knee adds a dramatic effect to the dress. It is the perfect silhouette for brides with a stunning hourglass figure or the petite brides. Soft, feminine and elegant – If you are looking for these three things, sheath dresses are the best option. This silhouette has a narrow shape that flares straight down from the hips. It follows the natural shape of your body, subtly showing off your curves. However, if there are some extra inches around your waist or hip, this silhouette is not the right choice. 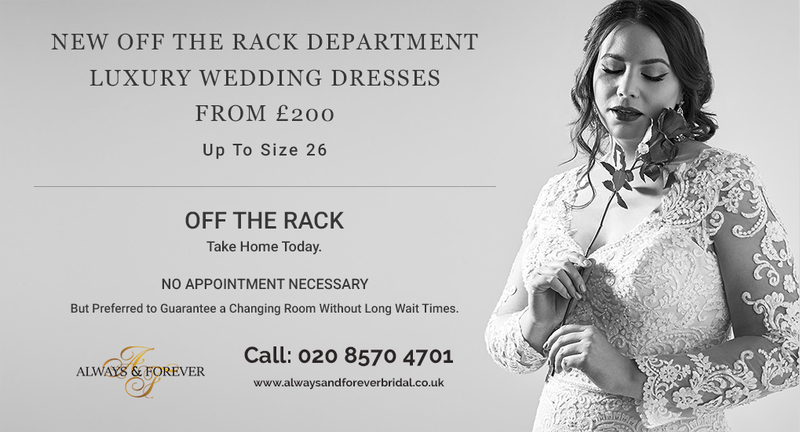 It works best for petite, tall and lean brides and ladies with a curvy hourglass figure. Stylist Pro Tip: Sometimes, it happens that many brides get confused and cannot decide between two or more wedding dress silhouettes. It happens very often. And so we always recommend our brides-to-be to try different styles to clear all the doubts and walk down the aisle confidently. 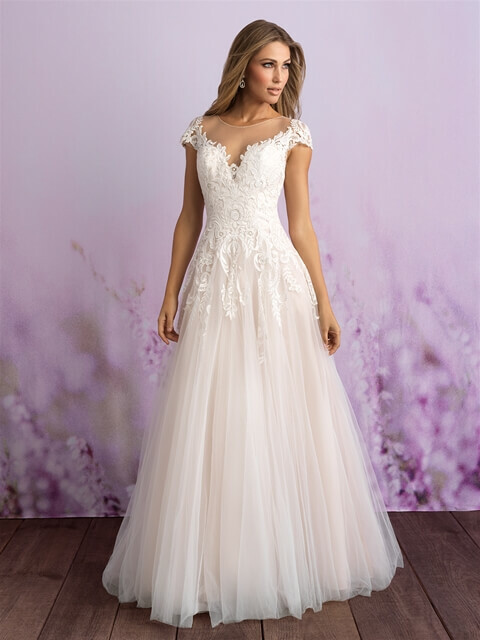 Are you looking for beautiful and unique options for wedding dresses? Contact us and check out our stunning collection of wedding dress in London.